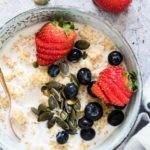 Quinoa Porridge with Berries is a dreamy breakfast that is light, fluffy, and full of flavour. I believe that ‘slow and steady wins the race’ begins with a healthy and nutritious breakfast that is filling but light — filling enough to keep the hunger pangs at bay, light enough to spend all morning outside with the mini chefs, having snowball fights and running across the snow-covered fields. 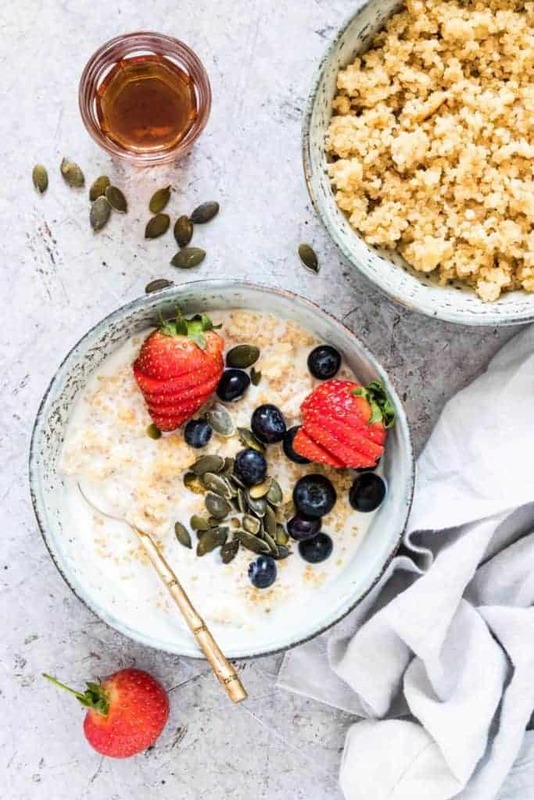 I did just that yesterday morning (the mini chefs proudly proclaimed victory in the snowball fight), fueled by this dreamy breakfast: Quinoa Porridge with Berries. 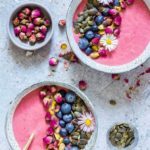 Much like my Creamy Tahini Porridge, I developed Quinoa Porridge with Berries with my sister in mind. She loves porridge, but she has trouble digesting normal milk. 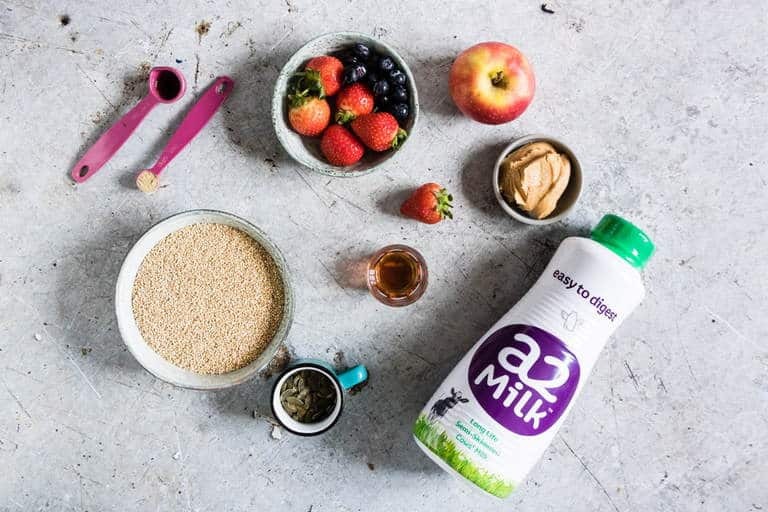 a2 Milk™ to the rescue (she drinks it daily now and is sooo happy), which is an easier-to-digest milk that has only the A2 protein and not the A1 protein. Pretty cool, I’d say. My sister is one happy milk drinker again. Oh, and I should mention the all that milk goodness in this porridge is thanks to Long life semi-skimmed a2 Milk™. 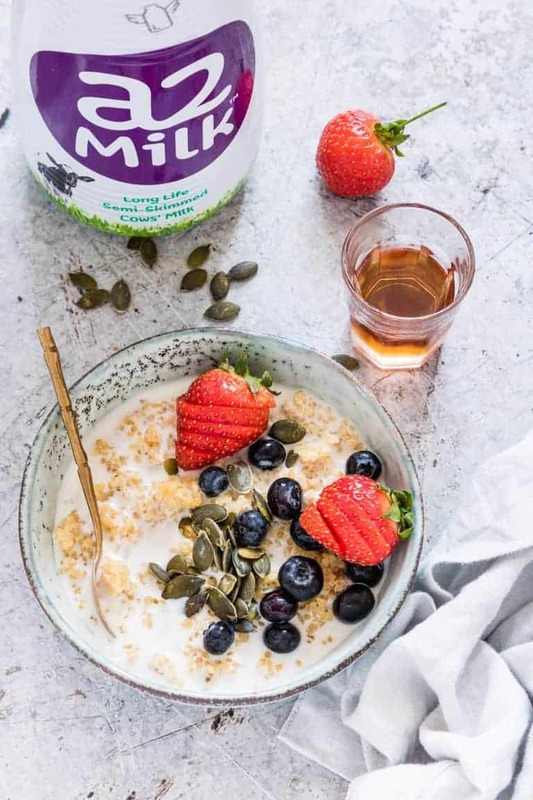 Not only is it easier to digest, but the Long life a2 Milk™ has been heat-treated and will stay fresh unopened in your cupboard for up to 6 months. Even better. So, let’s get started on this quinoa porridge recipe. Step 1. Gather your ingredients: quinoa, milk (a2 Milk™ if you have it), vanilla, cardamom (one of my favourite spices), apple, berries, honey, pumpkin seeds, and almond butter. Step 2. Wash quinoa under a running tap, rubbing it through your fingers for about 3 mins. This removes the bitter outer coating. Step 3. Let quinoa drain for a few mins. Step 4. Add quinoa to a pot with milk (500 ml), vanilla and cardamom and bring to a boil. Step 5. Reduce to a simmer, cover, and allow to cook for 15 mins. During this step, you will see tiny spirals coming out of the quinoa (aka the germ). Step 6. Remove quinoa from heat, fluff the grains and allow them to cool for 10 mins. Step 7. 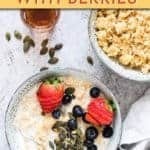 Top with berries of your choosing (strawberries and blueberries are a popular choice in my household), pumpkin seeds, honey, and the remaining milk mixed with almond butter. 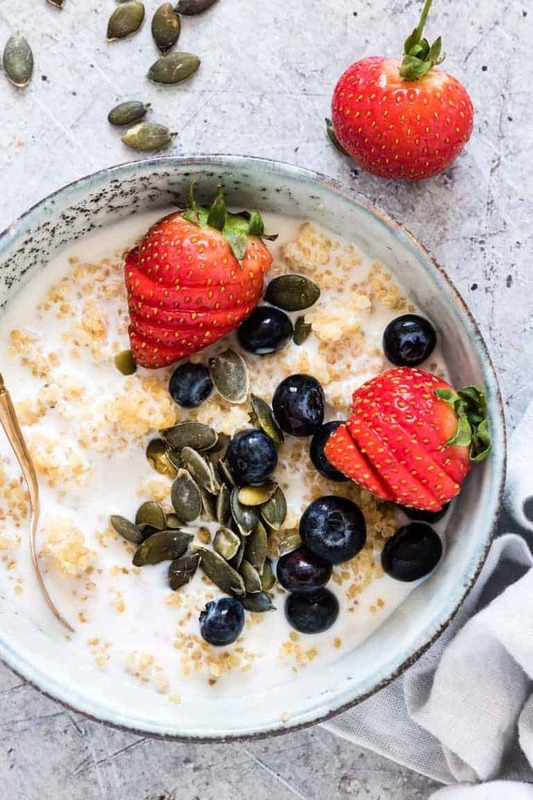 Healthy breakfast perfection, wouldn’t you say? 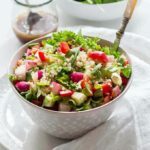 If you would like more gluten free quinoa recipes like this one, check out my Grilled Avocado Stuffed with Veggie Quinoa and my Baked Quinoa Falafels with an Orange Tahini Dressing. Try these Gingerbread Buckwheat Waffles. Thank you for reading my healthy gluten free quinoa porridge recipe post. And please come visit again as I continue dreaming up recipes, traditional African recipes, African fusion recipes, Sierra Leone recipes, travel plans and much more for you. 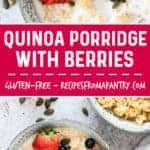 Don't forget to tag #recipesfromapantry on Instagram or Twitter if you try Quinoa Porridge with Berries! It is really, really awesome for me when you make one of my recipes and I'd love to see it. You can also share it on my Facebook page. Please pin this recipe to Pinterest too! Thank you for reading Recipes from a Pantry. Rinse under a running tap and thoroughly wash the quinoa, rubbing through it with your fingers, for 3 mins to remove any bitter outer coating. 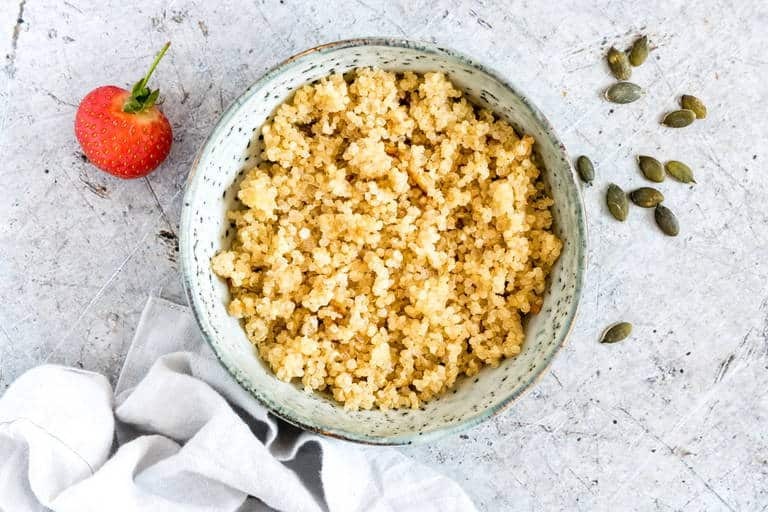 Place the quinoa into a pot and add in 500 ml milk, vanilla and cardamom and bring to the boil. Reduce to a simmer, cover and let cook for 15 mins - you will see tiny spirals coming out of the seeds. Serve and top with apple, berries, pumpkin seeds, and honey. Mix almond butter in with remaining 125 ml milk and pour over top. 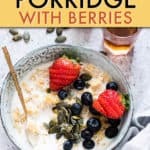 I never thought of making porridge out of quinoa! Looks delicious and so healthy! 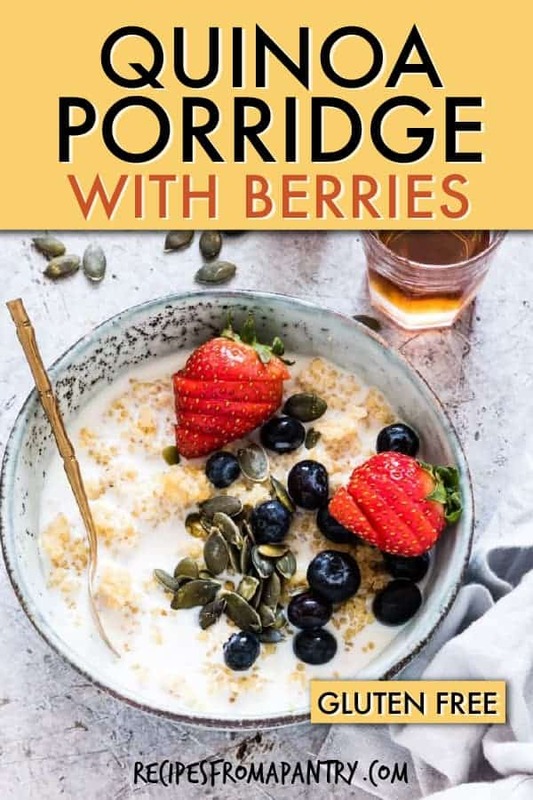 Will definitely try it soon – I love porridge (especially when it’s so cold like these days), and also really like quinoa. Thanks for a delicious recipe! Diets of vegetables, water, and air – hahahahaha. 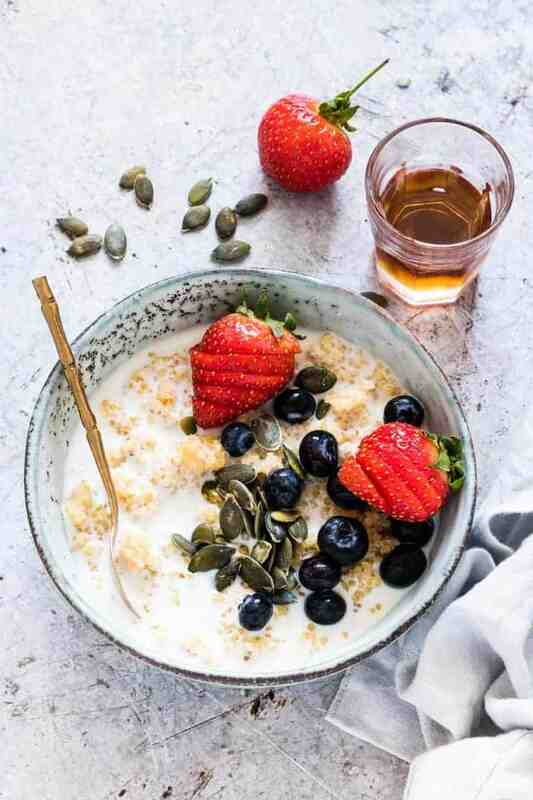 This porridge looks delicious, and quinoa is such an under appreciated breakfast grain. This looks so nourishing, but also cozy. Both my husband and daughter have lactose intolerance issues. I’ve not heard of A2 milk. I’ll have to see if I can find it and if they can digest it. 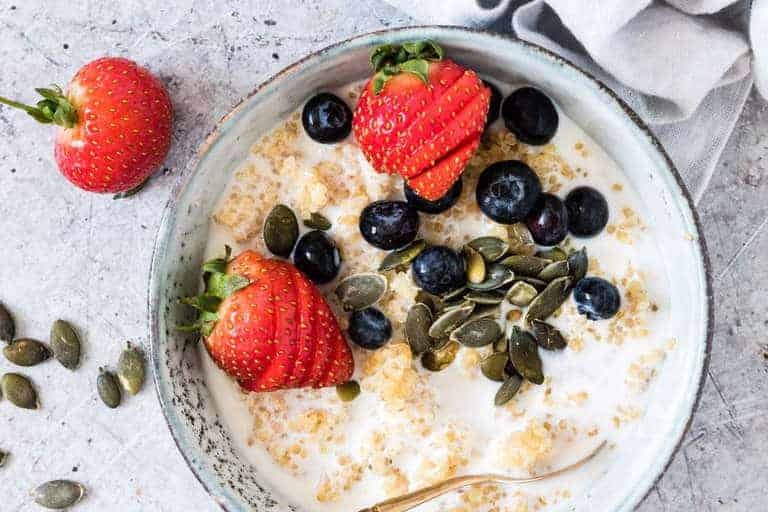 This porridge looks delicious and healthy too! I’m such a big fan of quinoa porridge! First time I heard about it, I wasn’t sure I would love my quinoa sweet but it’s actually super delicious. Your pictures are beautiful, as always! I love having quinoa for breakfast! All of my daughters have issues with milk, so I am definitely going to tell them about this! Slow and steady definitely wins the race – especially when it comes to breakfast! Yum! 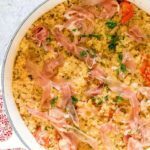 LOVE the idea of quinoa for breakfast! So healthy! Oh wow! I would never think quinoa as porridge! I got to try this! I was given some quinoa a couple months ago, and it has been in the back of my cabinet this whole time, because I had no idea what to do with it. Your site is the first one I have found to have wonderful recipes, great instructions, and to be informative as well.